Greenland Shark A pair of researchers work with a Greenland shark on deck. These animals have been measured at 16-feet long, with anecdotal accounts of 20-foot giants. © Julius Nielsen. Shark in Water A tagged Greenland shark swims through the icy waters of the North Atlantic. © Julius Nielsen. In 1624, the Dutch established a trading post in what would become Manhattan, Louis XIII began building Versailles, and Jamestown in Virginia became an English crown colony. 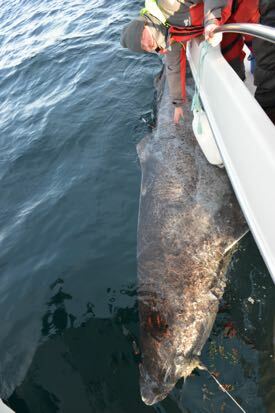 It’s also the most likely birth year of a Greenland shark that was recently captured in the frigid waters of the North Atlantic. That’s according to research reported in the cover story of today’s issue of the prestigious international journal Science. 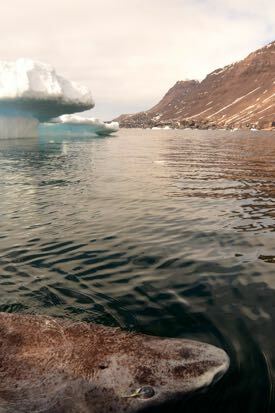 The study, led by Julius Nielsen and Dr. John Steffensen of the University of Copenhagen, is co-authored by Dr. Richard Brill of William & Mary’s Virginia Institute of Marine Science and a team of other researchers from Denmark, Greenland, England, and the U.S.
Based on radiocarbon dating of tissues from Greenland sharks collected on expeditions between 2010 and 2013, the scientists calculate an age of 392 years for their largest specimen—a 16-foot behemoth—with an uncertainty of plus or minus 120 years. This gives a life span of at least 272 years and at most 512 years, the latter giving a birthdate of 1504—the year Michelangelo finished his David. The uncertainty estimates are less for the smaller sharks: 40 years on either side of those estimated at 200 years old, and only 5 years on either side of those found to be around 50 years old. The team’s results suggest the Greenland shark lives longer than any other known vertebrate, and raise concerns about its conservation in light of pressures from commercial fishing. The sharks are caught incidentally in North Atlantic fisheries for cod, halibut, and other bottom-hugging species; and have themselves recently been targeted as an exotic seafood for export to China. The meat is considered poisonous—Steffensen says Greenlanders never eat it and avoid giving fresh meat to their sled dogs because they get “shark drunk”—but according to Danish fishing interests it can be made edible by a “boil-dry-boil” process. In addition to slow growth, a related factor that makes Greenland sharks vulnerable to fishing is the late age at which they reach sexual maturity. Says Nielsen, “Females are reported to reach sexual maturity at lengths greater than 13 feet, the corresponding age would be at least 156 plus or minus 22 years.” Thus any female harvested within the first century and a half of its life would never have a chance to reproduce. Scientists had long suspected a pronounced age for Greenland sharks based on their enormous size and what Brill calls a “wildly slow” growth rate. The largest animals exceed 20 feet and weigh more than a ton, while early tagging studies suggest these sluggish, cold-water animals grow less than half an inch per year. But aging these cartilaginous creatures long posed a challenge. That’s where Brill, a fish physiologist who splits his time between VIMS and the National Marine Fisheries Service, comes in. He says his main role in the project was collaborating with Steffensen, Nielsen, Dr. Jan Heinemeier of Aarhus University, and Dr. Peter Bushnell of Indiana University South Bend to figure out how to age an animal that like all other wildlife has no birth certificate, and equally troublesome, none of the bony growth rings that scientists typically use to age other marine and terrestrial vertebrates. 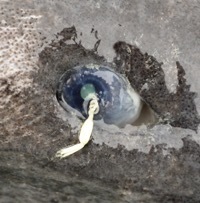 With no bones about it, the researchers decided to look in what might seem a surprising place—the shark’s eye. Steffensen describes the genesis of this idea with a tale that sounds like it could have come from an episode of CSI. “In 2009, I got a piece of vertebrae from a Greenland shark and convinced the local hospital to make X-rays. But it was obvious right away that it wasn’t really calcified and thus gave no info.” So he instead contacted Heinemeier, who told him about the forensic use of eye lenses to date human remains, and suggested they try that approach with sharks. To assign calendar years to this ocular diary, the researchers turned to radiocarbon dating, a technique commonly used to age organic materials. For their purposes, a particularly important event was the release of large amounts of radioactive carbon isotopes into the atmosphere and ocean beginning with aboveground nuclear tests following WWII. Detection of this “bomb spike” in living tissues provides a clear signal that the tissues developed after about 1960. When the researchers measured the radiocarbon levels in eye tissues from their 28 sharks, they found that only the three smallest (1-, 5-, and 7-feet long) had the elevated levels expected for an animal born after 1960, implying that all their other specimens were older than 56 years, or “pre-bomb.” Comparing the lengths of these older sharks with the standard decay rate for naturally produced radiocarbon isotopes revealed a graceful aging curve with 11-foot sharks born about 1900, 15-foot sharks born about 1800, and 16-foot sharks born about 1700 or earlier. The team concludes their paper with additional evidence to corroborate the Methuselah-like story told by their use of radiocarbon dating. This includes the presence of contaminants from the burning of fossil fuels and other modern human activities only in sharks shorter than 10 feet and dated at less than 100-years old, coincident with the full onset of the industrial revolution in the early 20th century. Brill says their tagging work, which they began about 4 years ago, is ongoing in collaboration with Norwegian and Icelandic partners. “My colleagues from Indiana and Denmark have put close to 30 pop-up satellite tags on these animals, and we’re just working up that data now.” They expect to publish those results sometime next year.